So in May views came back down to Earth. I found it pretty depressing. For the second time, a video had done really well, leading me to believe the channel was finally taking off. And for the second time that video’s viral moment came and went, leading to a massive decline in viewers. 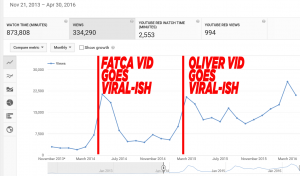 Views for “FATCA Explained in 4 Minutes…” rose and fell between April and July 2014, and “How Powerful Is John Oliver” rose and fell between January and May 2015. The graph below shows the whole arc of monthly views from the start of weekly production through to April 2016. The impact on my mood is significant because it becomes a bit of a self-fulfilling prophecy. The one thing I’ve learned for sure about the YouTube algorithm over the past couple years is that it values quantity. More videos is always better. No matter how those videos do, the more often you post, the more likely YouTube is to serve up your entire back catalog of videos. In May of 2015 I got depressed about views and only managed to complete my required video a week. Less production due to less views leads quite directly to even less views. Getting bummed and unproductive is unwise, and it is also unjustified. A longer-term review of the viewership stats makes this clear. After both of these roller-coaster rides, the level of views was set at a new level. 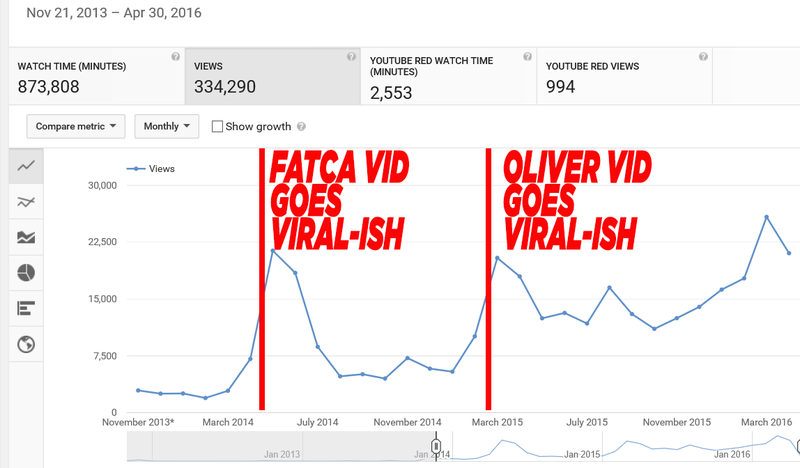 Before the FATCA video’s rise, views hovered around 2,000 a month. After that vid died down again, monthly views were in the 5 to 7,000 view range. After the John Oliver video died down, views settled around 10 to 15,000 views. The slump of a heavily viewed video is annoying, but some of the eyeballs that come in stick around, and if the other content is at all decent, a semi-viral video will do any channel a ton of good. This was a fairly light month for videos. In the Spring of 2015 my savings were dwindling so I started taking freelance projects, which slowed down video productivity. We started off with the “5 Dumbest Parts of The Black on Black Crime Myth” a topic that really gets to me. The vid is super simple, but with some good stats, and a dollop of anger it has performed really well. “Macedonia and the Endless Falls Of Empire” is a fun one as well. I like taking more obscure news items and using them to draw broader lessons. This gun battle in Macedonia, that nobody was talking about, provided a nice window on the history of the Ottoman, British and American empires. This is also one of my first videos to intensively use .SVG maps. This has become more and more of a thing over the past year. Prior to this vid, I put together older map videos in photoshop, which involves a lot of work and isn’t very precise. Starting here, I switched to vector based graphics, which allows for quicker workflow, and much more powerful animations through the use of Adobe Illustrator and Adobe After Effects. Fun stuff. As I mentioned above, views collapsed in May 2015, falling from 17,963 in April down to 12,434. Only one of the month’s top five videos was produced in May. Two of the four videos produced broke 100 views on the first day, and 12 months later all of them are over 200 views, and three of four are over 300. At the end of May 2015 we had 95 videos, all of which were viewed at least once in May, 68 of which were viewed more than 10 times, 13 of which were viewed over 100 times, and four of which (FATCA, John Oliver, Hillary Clinton, Black on Black Crime Myth) were viewed more than 1,000 times. It was a good month, but I wish I had produced more videos. The balance between freelancing and video production is one that I continue to struggle with. There’s only so much time really.